Lea and I have had a very enjoyable spring this year, as she has finally regained enough strength to be able to do some of the outdoor things she enjoyed so much before her illness. We have been spending a lot of time working on the lawn, getting it to look much better than it did. We have had regular applications of fertilizer/weed killer applied by a lawn service company, I’ve landscaped all around the house with paving brick to create flower gardens, and she has finally gotten to plant flowers again! It is a delight to see her taking an interest again, as she continues to reduce her pain killers, and is able to think more clearly. 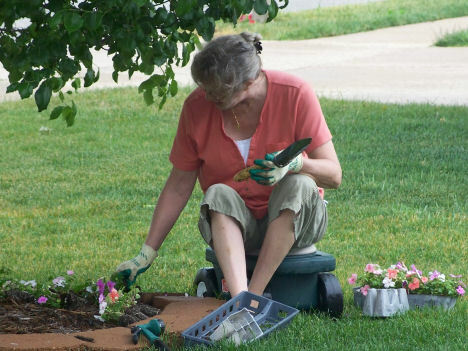 Taking care of her flower gardens, and tending her bird feeders is great therapy for her, and is helping her adjust to having to wear the binder on her abdomen for the forseeable future. Once she made up her mind that she was going to have to wear it, she just accepted it as fact, and is now dealing with the discomfort with a renewed attitude. Another bright spot in our future is the expected October arrival of our grandson! Lance and Kristin are expecting, and she is so excited! We are hoping we can get her knee surgery and rehabilitation completed in time for us to travel to Austin to be with the new parents to help them celebrate this wonderful blessing, and those plans will be a tremendous incentive for her to do her therapy and get through the rehab. It is wonderful to note her continued progress in regaining much of her old stamina, to enjoy hear her talking about our past and future, and I thank God for each and every day I have with her. Praise Him for His many mercies! And, as always, we are ever mindful of our undying gratitude to those who have sent such joyous support our way. Thank you, and God bless!